John Calvin Stevens designed the Classical Revival style Nathan Clifford School as part of the beautification movement in the City of Portland in 1907-09. 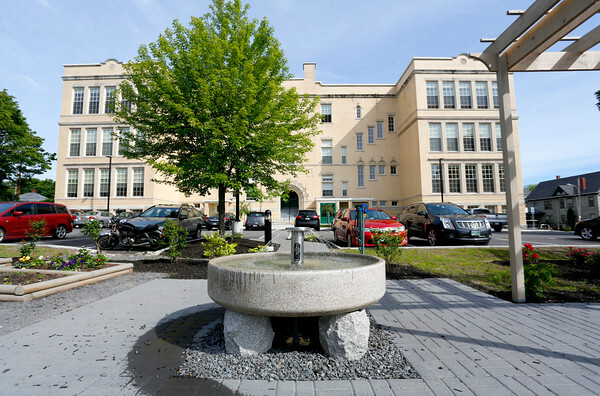 The school served as an anchor of the Oakdale neighborhood in Portland for over one hundred years. It closed its doors to much controversy in 2011 in favor of a new elementary school at another site. Developers Collaborative purchased the vacant and deteriorating building in 2013. Vandals had ripped screens, tagged the building with graffiti, and broken many of the windows. The building suffered from a leaking room which led to damage of the alcove ceiling in the auditorium. 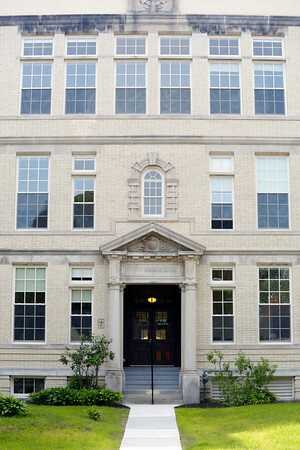 The east exterior needed extensive brick repointing in the blond faced brick. Much of the plaster tested positive for asbestos and therefore had to be either abated or carefully contained. Developers Collaborative also protected and preserved murals within the school created by students and a 1930’s visiting artist, as they felt the murals were intrinsic to the history of the building. The original handwashing basin from the girl’s bathroom was refurbished into a fountain within the landscaping. The total cost of the project was $7 million, and it received federal and state historic tax credits. The Nathan Clifford project preserved the historic integrity of the building, creating new spaces, valuable housing, and a community park for the neighborhood while still maintaining the historic identity of this iconic building. The project has become an example in the City of a successful public-private partnership.